Former Spurs guard Speedy Claxton led Jay Wright-coached Hofstra to the 2000 NCAA tournament. Craig “Speedy” Claxton made history in San Antonio 15 years ago when he came off the bench to spark the Spurs to an NBA title-clinching victory over the New Jersey Nets. Claxton was on the floor playing point guard in Game 6 of the 2003 NBA Finals when the Spurs slammed the Nets with a 19-0 run to rock the SBC Center. Later, he helped the city celebrate its second championship. Tonight, another basketball title is on the line in San Antonio, and Claxton has a rooting interest. Now an assistant coach at Hofstra, he would like nothing more than to see the Villanova Wildcats beat the Michigan Wolverines in the NCAA finals at the Alamodome. Well, it’s simple, really. Villanova’s coach is Jay Wright, a man who helped mold Claxton’s remarkable career. As head coach at Hofstra in the 1990s, Wright recruited Claxton to the school in Long Island, New York. Together, they led a downtrodden program to the 2000 NCAA tournament. As a result, Claxton’s career took off. He spent the next nine years cashing NBA paychecks after being selected on the first round of the 2000 draft, 20th overall, by the Philadelphia 76ers. Claxton, naturally, has always been a big Jay Wright fan. But considering that the NCAA title game is being held in San Antonio, he’d really like to see his mentor win, so the two could share in some personal hoops symmetry. “I just thought about it when we got on the phone earlier,” he said in a telephone interview with The JB Replay. “Oh, wow, (what if) we both win in the same city? “I’m going to have to text him and tell him to go ahead and win that championship. That’s pretty dope. Wright joked with the media covering the Final Four that he started his career with three losing seasons at Hofstra and heard rumblings that he might get fired. But the coach kept plugging away. Things started to change quickly when he recruited Claxton, a 5-foot-11 dynamo from Christ the King High School in Middle Village, N.Y.
Claxton said he thinks there are two sides to the coach. Off the court and on the court. Off the court, the coach is charismatic and charming. On the court, he can be intense and demanding. What Claxton learned from Wright at Hofstra served him well in the NBA. “He made me the player that I am,” Claxton said. 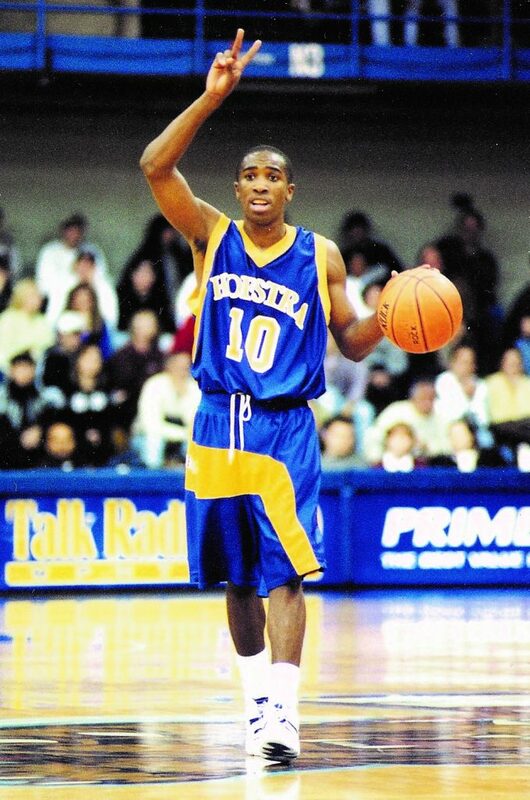 “When I played (for Hofstra), I played every possession like it was the last, because of him. “I didn’t just want to get a stop one time down. Or two times down. I wanted to get a stop every time my man had the ball. Claxton has worked on Hofstra’s staff for the past five years, including four as an assistant coach, under Joe Mihalick. In December, Claxton got an up-close look at Villanova when the Pride hosted the Wildcats off campus at Nassau Coliseum. Two years ago, Villanova entered the Final Four at Houston and broke through with its first national title since 1985 by beating both Oklahoma and North Carolina. This time, its’s a different feeling for Claxton.